UCLA to play lead role in national Smart Manufacturing Institute. Engineering professor Xiaochun Li is the technical director of the institute’s California region. In June President Obama announced a $70 million federal award to a nonprofit cofounded by UCLA to create a nationwide Smart Manufacturing Innovation Institute, with the goal of improving the efficiency of advanced manufacturing. UCLA will lead the California Regional Center with partners including the California Manufacturing Technology Consultants, UC Berkeley, UC Irvine, USC, California State University, and California Community Colleges. It will also work with organizations in Michigan, Missouri, and Montana. 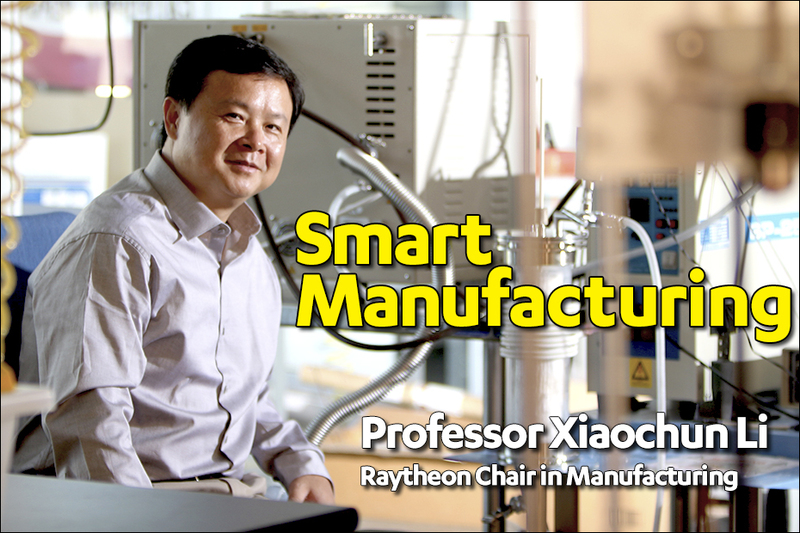 Xiaochun Li, holder of UCLA’s Raytheon Chair in Manufacturing and a professor in the Mechanical and Aerospace Engineering, and Materials Science and Engineering departments, is the technical director for the institute’s California Regional Center. He answered a few questions on what’s next. What specific technologies are you looking at to help improve manufacturing? Xiaochun Li: Recently, there has been much stronger demand for better quality and higher productivity in manufacturing. Also, energy efficiency and environmental sustainability have become central concerns. Smart manufacturing is the use of real-time data and information and communications technology to advance manufacturing intelligence, and to significantly improve productivity, performance, technology adoption, as well as addressing sustainability issues. More specifically, this will require the research, development, and transition to industry of advanced sensing and instrumentation; process monitoring, control, and optimization; advanced hardware and advanced software platforms; and real-time and predictive modeling and simulation technologies. For the new center, my Scifacturing Laboratory will mostly focus on advanced sensing, process monitoring, control, and optimization. Micro/nano sensors embedded into manufacturing systems will survive hostile environments and provide high accuracy, long-term stability, and good reliability during service. We will design, fabricate and apply distributed embedded micro/nano sensors and wireless interconnects into harsh manufacturing environments for high energy efficiency. We will also work on an enabling manufacturing platform called SmartCell that will integrate algorithmic control software, embedded sensing, communications, process monitoring, and data-intensive continuous improvement in conjunction with cutting-edge innovations in robots, wireless network, tooling, processes, and equipment for traditional and emerging manufacturing processes. What is an example of a particular industry that will benefit? Li: The metal processing industry consumes a significant amount of energy. Smart manufacturing will incorporate these new technologies to significantly improve energy efficiency and product quality in highly energy-intensive manufacturing processes. What are UCLA’s strengths in this area, and how do they apply to this initiative? Li: UCLA offers a spectrum of strength in the areas of systems and control engineering, micro/nanomanufacturing, science-based and data-based modeling, and cybersecurity. For example, Professor T-C Tsao, of mechanical and aerospace engineering, is working on highly optimized, efficient, and automated composite manufacturing to achieve a substantial increase of combined speed and dynamic precision over current numbers in industrial composites manufacturing. Other experts will be actively engaged in the new institute and center to make a paradigm shift in smart manufacturing. UCLA Vice Provost of Information Technology Jim Davis, who is also a professor of chemical and environmental engineering, will serve as the institute’s interim executive director. The institute includes more than 200 partners from the Smart Manufacturing Leadership Coalition, which UCLA cofounded in 2006. Partners from more than 30 states include representatives from academia and government, as well as dozens of industry partners, including Google, Microsoft, and Northrop Grumman. The new Smart Manufacturing Innovation Institute seeks to fuel industry growth in L.A., in California, and across the nation, using more than $140 million in public-private investments to develop advanced manufacturing technology and support a workforce and education pipeline.